Find the courage to step inside the haunted opera house and discover mysterious rewards in Universal Monster's The Phantom's Curse slot by NetEnt! This mysterious slot is set with a classic theatre ambience across 5-reels and 40-lines. Fans of the Phantom of the Opera will love the spellbinding tale of how the disfigured Phantom falls for the beautiful soprano Christine in this slot. This scintillating release is packed with a range of bonus features like chandelier scatters, masked phantom wilds, sticky wild re-spins and pick-and-click bonus game. Find the courage to step inside the haunted opera house and discover mysterious rewards in Universal Monster’s The Phantom’s Curse slot by NetEnt! 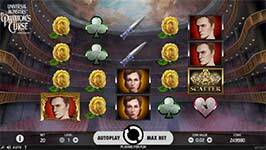 This mysterious slot is set with a classic theatre ambience across 5-reels and 40-lines. Fans of the Phantom of the Opera will love the spellbinding tale of how the disfigured Phantom falls for the beautiful soprano Christine in this slot. This scintillating release is packed with a range of bonus features like chandelier scatters, masked phantom wilds, sticky wild re-spins and pick-and-click bonus game. This terrific release joins the growing family of Universal Monsters slot machines which already includes Dracula, Frankenstein, Creature from the Black Lagoon and The Invisible Man. Wilds – Wild symbols substitute for all symbols except the scatter and bonus symbols to complete wins. There are five symbols that share the same payouts and create bet line combinations with each other and they include the mask, stacked mask, masked phantom, stacked phantom and stacked Christine. Stacked Symbols – Both the first and last reel can contain Stacked Bonus Symbols during the main game (not present in free spins). There are three different types of stacked bonus symbols. The stacked phantom appears only on the first reel, while the stacked mask and stacked Christine symbols appear only on the last reel. Pick-and-Click Bonus – The Pick and Click Bonus game is triggered when the Stacked Phantom symbol lands fully on reel 1 and Stacked Christine symbol lands fully on reel 5. The game then has two stages. In stage 1 you have 8 roses to choose from with some revealing coin wins while others reveal blocker symbols. After you choose a blocker symbol in stage 1 you move on to stage 2. In stage 2 you choose 1 of 3 mirror with each representing a different multiplier value. The coin win from stage 1 is then multiplied by your multiplier from stage 2 and you are awarded your prize. You could win up to 7200 coins in this bonus! Masked Phantom Re-Spin – The Masked Phantom Re-spin is triggered when a Stacked Phantom symbol lands fully on reel 1 and a Stacked Mask symbol lands fully on reel 5. The Bonus Stacked Symbols as well as Mask symbol and Phantom symbols visible during the spin that activated the Re-spin, turn in to wilds and stick on the reels for a free re-spin. Free Spins – Land three scatter symbols anywhere on reels 1, 3 and 5 to trigger the free spins bonus round. During Free Spins, a chandelier hangs from the ropes appearing next to the five reels with each rope connected to a certain reel. Landing a Masked Phantom symbol on a reel cuts that section of rope and highlights the reel connected with that section. When all five reel ropes have been cut, the chandelier falls and the free spins end.